Proprietary Name: Health Mart Allergy And Congestion What is the Proprietary Name? Non-Proprietary Name: Loratadine, Pseudoephedrine Sulfate What is the Non-Proprietary Name? Health Mart Allergy And Congestion with NDC 62011-0354 is a a human over the counter drug product labeled by Mckesson. 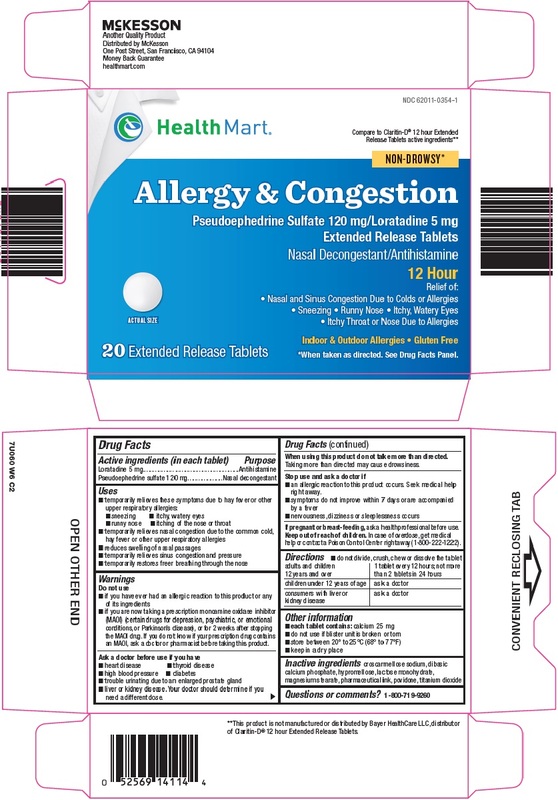 The generic name of Health Mart Allergy And Congestion is loratadine, pseudoephedrine sulfate. The product's dosage form is tablet, film coated, extended release and is administered via oral form. Dosage Form: Tablet, Film Coated, Extended Release - A solid dosage form that contains medicinal substances with or without suitable diluents and is coated with a thin layer of a water-insoluble or water-soluble polymer; the tablet is formulated in such manner as to make the contained medicament available over an extended period of time following ingestion. FDA Application Number: ANDA076050 What is the FDA Application Number? •if you have ever had an allergic reaction to this product or any of its ingredients •if you are now taking a prescription monoamine oxidase inhibitor (MAOI) (certain drugs for depression, psychiatric, or emotional conditions, or Parkinson’s disease), or for 2 weeks after stopping the MAOI drug. If you do not know if your prescription drug contains an MAOI, ask a doctor or pharmacist before taking this product. •heart disease •thyroid disease •high blood pressure •diabetes •trouble urinating due to an enlarged prostate gland •liver or kidney disease. Your doctor should determine if you need a different dose.